The final out of the World Series marks the beginning of baseball's second season, when teams court free agents and orchestrate trades with the hope of building a championship contender. The real and anticipated transactions generate excitement among fans who discuss the merit of moves in the arena informally known as the "hot stove league." In Hot Stove Economics, economist J.C. Bradbury answers the hot stove league's most important question: what are baseball players worth? With in-depth analysis, Bradbury identifies the game's best and worst contracts-revealing the bargains, duds, and players who are worth every penny they receive. From minor-league prospects to major-league MVPs, Bradbury examines how factors such as revenue growth, labor rules, and aging- even down to the month in which players are born-shape players' worth and evaluates how well franchises manage their rosters. He broadly applies the principles of economics to baseball in a way that is both interesting and understandable to sports fanatics, team managers, armchair economists and students alike. J.C. Bradbury received his Ph.D. in economics from George Mason University in 2000 and is currently an associate professor at Kennesaw State University in metropolitan Atlanta. 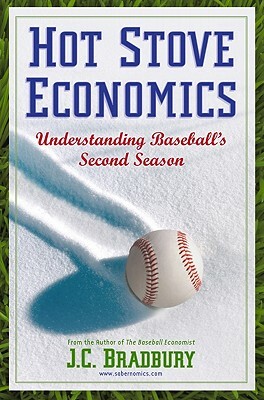 Known for his expertise in the economics of sports, he is the author of the The Baseball Economist and runs the weblog Sabernomics.com. In addition to his many academic publications, he has published articles in popular press outlets that include ESPN Magazine, The New York Times, and The Atlanta Journal-Constitution. He is a life-long Braves fan and lives in Marietta, Georgia with his wife and two daughters.